On Tuesday we picked up our China Visa in Hong Kong. As a UK citizen I am allowed to be in Hong Kong for 180 days, Paul as an Irish Citizen is able to stay for 90 days, but in order to go to the rest of China we had to obtain a China Visa. This can be done within Hong Kong, if you are heading there first. If you want to go to another part of China first, then you will have to obtain your China Visa in your home country or in other nearby countries whilst you are travelling, ie in Bangkok. You have to fill out a visa form when you get to the embassy, or you can download it online and fill it in before, to save time. When you get to the embassy, there will be two queues outside, one for people applying for a visa and the other for people who are coming to collect their visas. The line can get quite long, so I suggest you arrive early and remember they close from 12-2pm for lunch. When you get inside you will find a form that has to be filled in, there are desks for you to do this on, and computers that take you through all the questions, to help you with your answers. Then you will be given a number, which you have to wait to be called, before you take your form and passport up to the desk. It took us about 40 minutes to get our number called. Once our number was called we went over to the desk and it was very straight forward from then on. We just handed over the forms and our passports and we were asked did we want the express service or normal service. The normal service is the cheapest and takes 4 days to process. This is what we went for, but if you are in a rush to get your visa you can pay for next day service. The fee for a UK citizen is 450 HKD (£40) and for Irish Citizens it is just the standard fee of 150 HKD (£13). So thank goodness Paul is Irish, as it made it a lot cheaper for us! To see all the prices for different countries, see the link below. You are given a receipt and told that you can pay when you pick it up, 4 days later. Your passports are left in the office, as they put your visa on a whole page inside. The process for getting a China visa in Hong Kong is very straight forward, but remember if you are not planning on heading to Hong Kong first, then you must obtain your visa before coming to China. 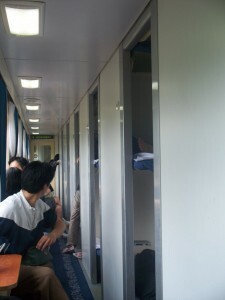 We are heading to Beijing today (10/06/10). We are getting the 3.15 pm Train from Hung Hom Station in Hong Kong to Beijing. The train journey will take 24 hours. We purchased our tickets 3 days before from the Hung Hom station. There were not many seats left, so I guess it is always best to book your ticket at least a week in advance. 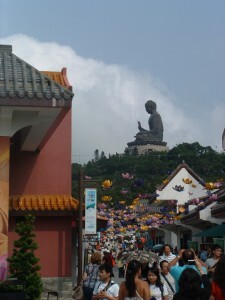 Saturday 5th June we went to Lantau Island to visit the ‘Big Buddha’. To reach this we took the MRT from Kowloon Station to Tung Chung Station and then we took bus number 23 to Po Lin Monastery (costing us 17 HK each-about £1.50) The other option is to take a cable car from Tung Chung Station to the foothill of the giant Buddha. This is a more expensive option but it is meant to be very scenic. The bus journey took us on a steep, windy hill-the view was beautiful, looking over to the many little islands of Lantau Island. We could see lot’s of little beaches on the many islands and a backdrop of mountains all around. The journey took around 30 minutes, then we arrived at the at the village where the Giant Buddha is. The Buddha is 34 metres (112 ft) tall, weighs 250 metric tons (280 short tons), and was the world’s tallest outdoor bronze seated Buddha prior to 2007. 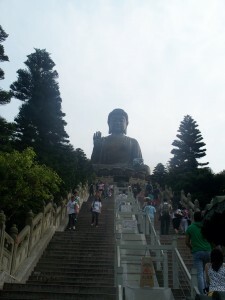 We had to climb 268 steps in order to reach the Buddha. When at the top we were able to walk around the Buddha and see the view all around. In the distance you can see Lantau peak, which is the 2nd tallest peak in Hong Kong, 934 m above sea level. We wished we had got there earlier to climb to the top-but the sun was already starting to set by this time! 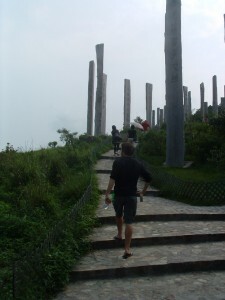 A lot of people climb up the peak early morning, to watch the sunrise from the top. After taking lots of photos and enjoying the view from the top, we started to walk back down the 268 steps. Then we took a walk on the ‘Path of Wisdom’. I’m sorry to say that we don’t feel any wiser after this, as all the words of wisdom were written in Chinese on tree trunks! 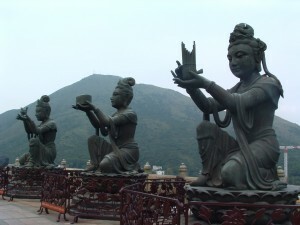 You could easily spend a whole day here as there are lots of things to do including seeing the Giant Buddha, taking lots of walks, including climbing Lantau Peak and there is also a small village with lots of shops to look around. Will write more soon. We are going to pick up our China Visa today-it takes 4 days to receive. Hopefully everything has gone ok with it-if so we will leave Hong Kong on Thursday. We have decided to go to Beijing next. We have a booked a train from Hong Kong to Beijing, costing us 517 HKD each (£45), the journey will take us 24 hours. 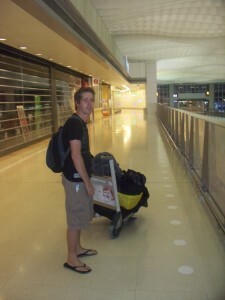 We arrived in Hong Kong Tuesday 1st June around 9pm. We decided to sleep in the airport, as we didn’t want to start looking for accommodation in the city whilst it was dark. Hong Kong airport is a great airport to sleep in-there are loads of places in the departure and arrival lounge where you can get plenty rest. There is also the Plaza Premium Lounge where you can pay to get a private space to rest, there are also showers that you can pay to use. The restaurants and food places close around 11 pm, but the 7/11 shop, which can be found on the 5th floor terminal 2, stays open all night. We finally found a spot to sleep. Although it wasn;t the most comfortable night ever-it was worth it for one night-and it didnt cost us a penny! The next morning, we got our bus to the city. There are several ways of getting to the city. You can take a taxi, airport express (Mrt) or there are local buses directly outside the airport. We decided to take the bus, this is the cheapest option, costing us 33 hk Dollars each (£3), for the journey which is about 30km. Hong Kong Airport is on a small island of it’s own, connected to the other islands by bridges. We are staying in Kowloon, just of Nathan Road. We are close by to Victoria Harbour, where we can see the stunning Hong Kong skyline. (see the yellow star of the map for location) We were shocked at the prices of hotels, compared to the rest of Asia. So far we had been paying around £10 a night for a nice spacious room, now we are paying £40 for a box room, that only fits a bed and a small bathroom. I guess this is just preparing us for our return home, as you do not find hotels for £10 a night in Ireland or England, or meals for £1! Hong Kong is a very exciting city, with a similar feel to New York. The city doesn’t sleep, the lights on all the buildings make the evening look like day time! We took a walk down to Victoria Harbour last night to the Avenue of Stars. The Avenue of stars is found along the Tsim Sha Tsui promenade in Hong Kong, and features hand prints of stars and sculptures, including a two metre tall statue of the legendary kung-fu action star, Bruce Lee. Every evening there is a light show at 8pm. A symphony of Lights, is the largest permanent light and sound show, recoded in the Guinness World Records. 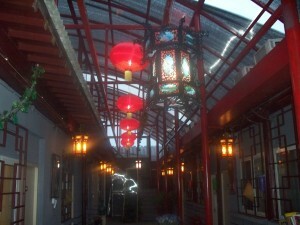 It covers more than 40 buildings on both sides of Victoria Harbour. This looked spectacular! Here is a short video we recorded.